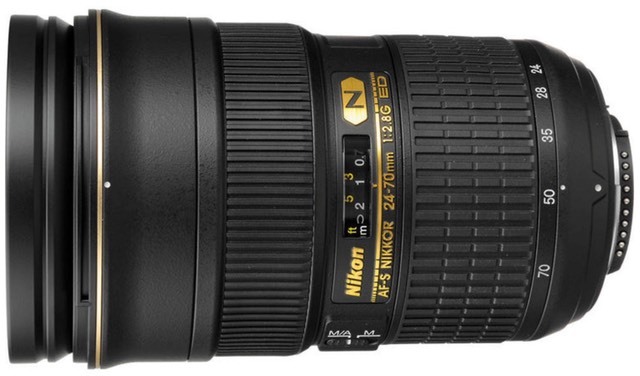 Thom's Mini Review: The 24-70mm seems long in the tooth these days. No VR is the usual complaint, but Nikon's more recent zooms—even the more consumer-oriented ones—sometimes can outshine the 24-70mm f/2.8G at something. On the other hand, the 24-70mm f/2.8G is well rounded and well behaved at its full focal range, with only a touch of (correctable) optical issues at the wide end. It certainly has proven to be a workhorse lens for many of us, and if you need f/2.8 in the mid-range, there wasn't a better choice until the f/2.8E version came out. This lens is big and heavy for such a short zoom ratio lens, though. If you're going for the f/2.8 trio (14-24mm, 24-70mm, 70-200mm) be prepared with a big bag and strong muscles. Replaced by 24-70mm f/2.8E VR, which is my recommended version.